Dad put up with a lot of things as you were growing up…namely YOU. He surely deserves a crown…and a kingdom...or a new car…something? Well, if you can't afford any of the above, you can at least give him a really cool Father's Day card (with a crown on it), to signify that he's a king among Dads everywhere! A father, a child’s first hero. Your first hero happened to be your Step-Father. He raised you with love, care, and patience. You’re a better person thanks to his guidance and support. 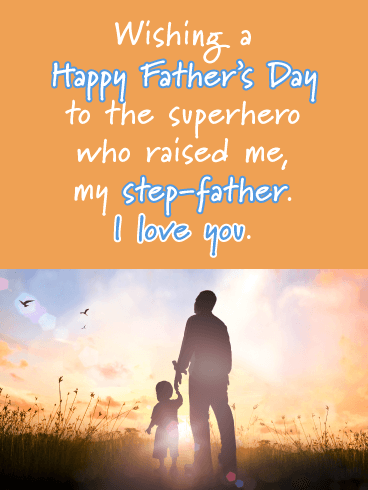 Send that special man the My Super Hero Happy Father’s Day Card for Step-Father to let him know how you feel. A glowing I love you across the sky lends a tender feel to this photo card. Send warm thoughts to your Step-Father with this darling child’s doodle themed card. 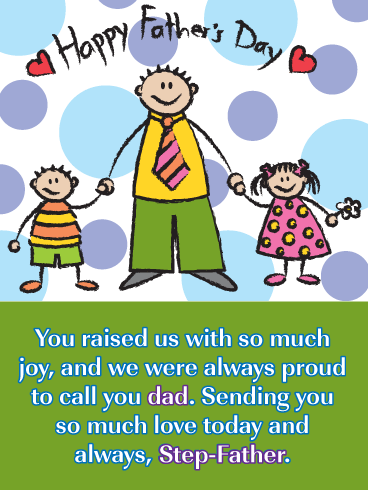 The Raised with Joy Happy Father’s Day Card for Step-Father shows a childlike drawing of a smiling dad in a big tie holding the hands of a small boy and girl. With some cartoon hearts for extra sweetness, this precious card is sure to make him feel loved when he receives it. 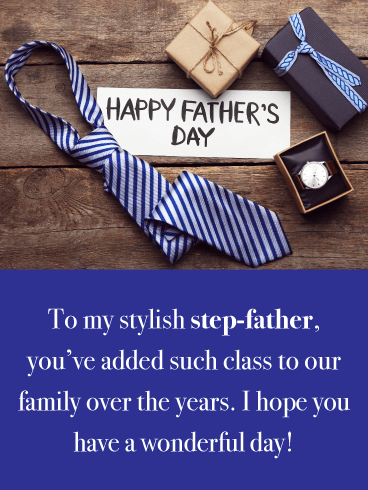 He’s got the style, he’s got the class…so it just makes sense that you have to send your Step-Father the Style and Class Happy Father’s Day Card! Wish that dear man a wonderful day with this fashionable card. 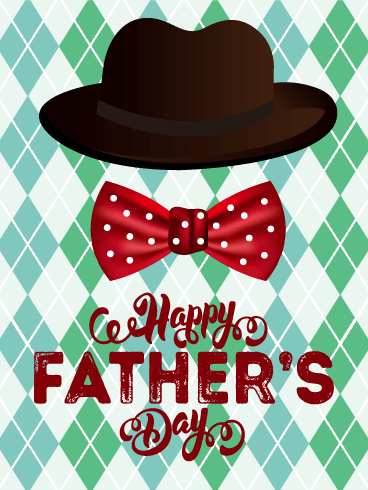 The rustic wood background, a blue and white striped tie, and a designer watch make this card stylish enough for your sharp-dressed dad! 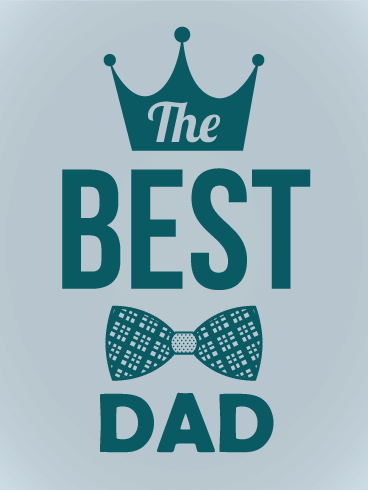 You're pretty sure that you have one of, if not THE, greatest Dad in the world. He always took care of you. 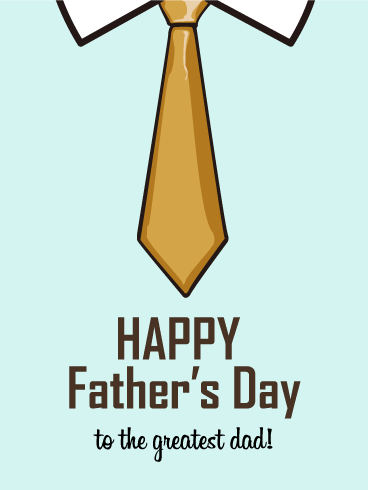 And this Father's Day card, dressed up with a fancy tie, will be a wonderful way to tell him you care! Pour a beer, raise your glass, and send up a big cheer! It’s Father’s Day and you can’t leave your world-class dad out! 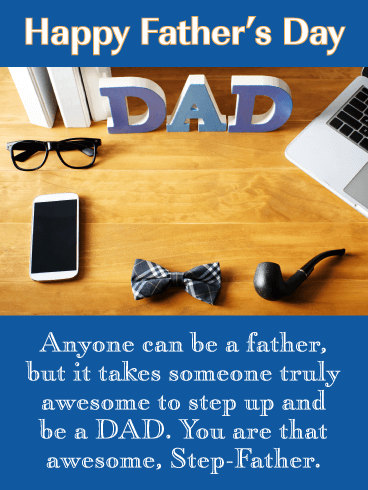 Sure maybe he’s your Step-Father, but that doesn’t make him any less a father to you. Cheers to the men who make fatherhood look fun. 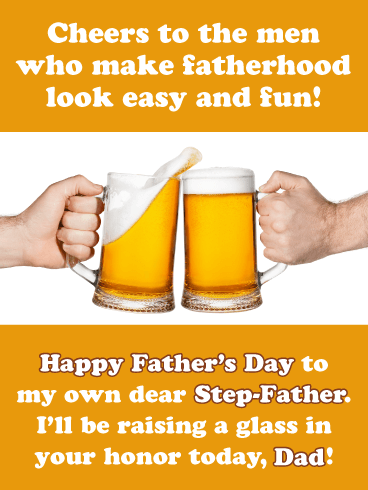 Toast your pop with the Cheers to Fatherhood Happy Father’s Day Card for Step-Father. Your Step-Father lifted you up. He encouraged your dreams. Any goal you had he supported it wholeheartedly. He was as dedicated a father to you as he could be and you love him for it. 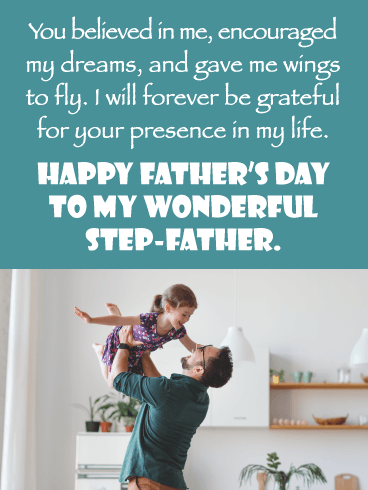 Send that awesome guy the Gave Me Wings to Fly Happy Father’s Day Card for Step-Father to make him feel cared for on this big day. 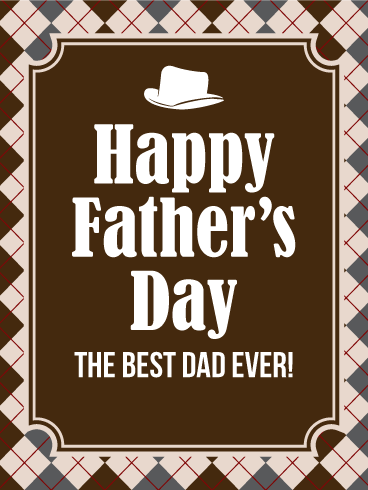 Almost any man can become a father, but it takes someone truly special to step up and be a dad. Thank the man who stepped into your life and made your childhood experience that much more awesome. 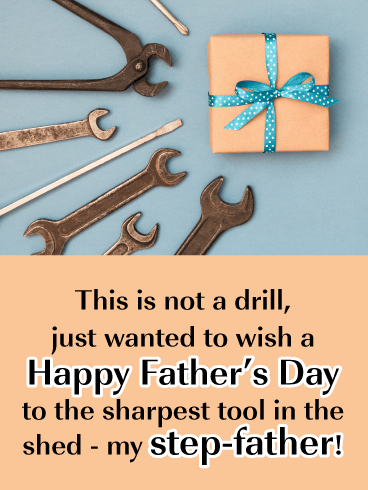 Send your Step-Father the Step Up to Awesome Happy Father’s Day Card to let him know just how cool you think he is. Dad was always the guy who got things done. He helped and guided you, and helped you turn into the amazing adult you are now. 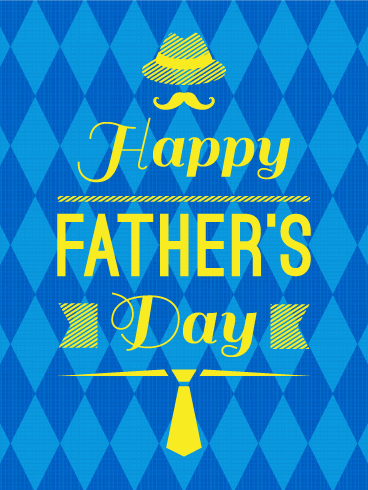 So take a moment to say thank you this Father's Day with a Father's Day card as handsome as this! Your Dad is pretty darn dapper, isn't he? 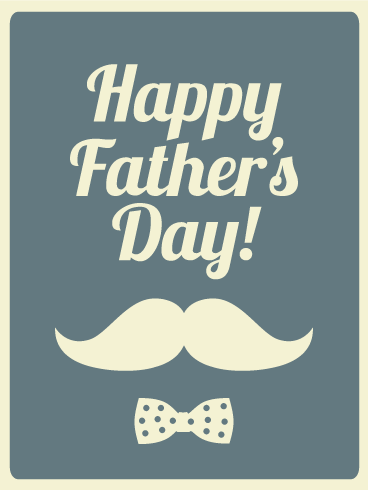 If so, then this handsome, retro-styled Father's Day card, complete with a bow tie, mustache, and bold script, is a great way to put into writing how much he means to you this Father's Day.